When Governor Andrew Cuomo signed the bill to legislate MMA in New York in March, rumours ran rife about when the first UFC card would take place in the Big Apple, and more intriguing - who exactly will headline Madison Square Garden? November 12 is the date set for UFC 205, the first major MMA event set to take place in New York is without any fights as of yet, however several blockbuster personalities have been touted to be in discussions already. Eddie Alvarez stunned Rafael dos Anjos with a blistering onslaught of strikes to become the newly crowned UFC lightweight champion ahead of the historic UFC 200 pay-per-view last week. 'The Silent Assassin' has only fought four times for the UFC, but his rich history in Bellator and DREAM have shown he possesses the pedigree to reach the pinnacle of his division in the biggest MMA promotion on the planet. The Philadelphia native is not short of fresh new contenders though, and a first title defence could be a realistic possibility in New York. 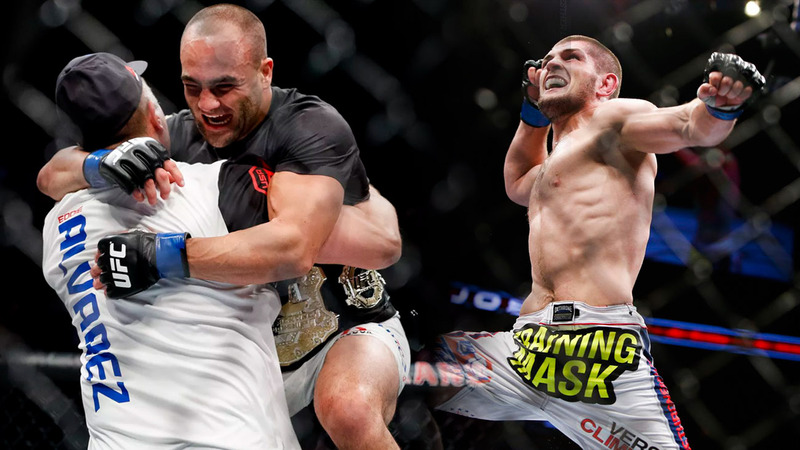 Undefeated Khabib Nurmagomedov sits atop the rankings as the number one contender to Alvarez's gold, and the Russian would likely have been facing dos Anjos for the title instead of Alvarez had it not been for his religious commitments over the holy month of Ramadan taking priority over his training. 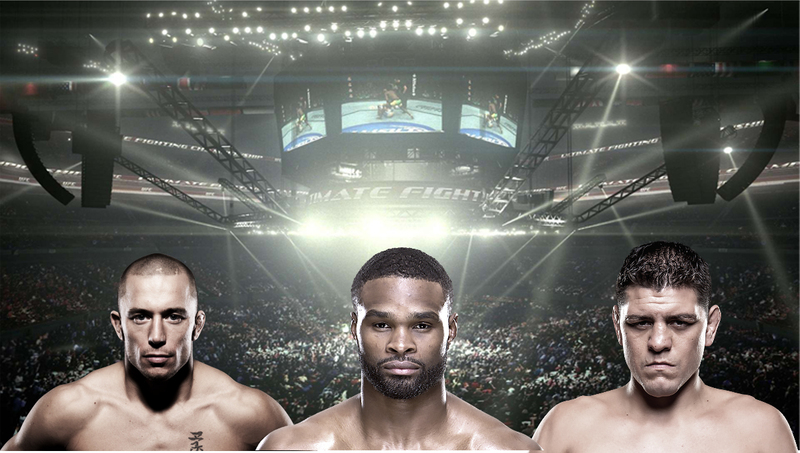 With four months to go until The Garden welcomes opens its doors to UFC, this is a fight that looks a real possibility. Nurmagomedov is undefeated in his 23 professional fights, and has been vying for a title shot ever since he burst onto the scene for the company. With the last two lightweight title fights not being shown on PPV, this writer feels as though the 155 strap has been overlooked recently, and what better card to contest it on than in The Big Apple? 'Rumble' and Teixeira will lock horns at the August UFC 202 card headlined by Conor McGregor's rematch with Nate Diaz. The 36-year-old Brazilian has never faced reigning champion Cormier in the UFC, and a win over the number 2 ranked Johnson will set him up for a title shot. With Jon Jones indefinitely out of the light heavyweight picture, 'DC' will be looking to extend his reign at the top of the food chain with a convincing performance in his next fight. His win against Anderson Silva meant very little, with the fight being set up extremely late and Silva lacking any training or a proper camp beforehand. Still, the veteran bruiser has already recorded wins against perennial contenders Alexander Gustafsson and Anthony Johnson in his two title fights, with the latter taking place to crown a new champion in the absence of Jones through suspension. Cormier is the real deal, and whoever emerges victorious from the showdown at UFC 202 will have their hands full with a persistent, brutal brawler who seeks to crush opponents down on the mat. At 32 years old, Anthony 'Rumble' Johnson is very much still in the prime of his MMA career, and possesses unparalleled one punch knockout power that has laid waste to the likes of Gustafsson, Antonio Nogueira and Ryan Bader. His impressive record shows he certainly has the qualities to make a great champion, and following his submission loss to Cormier in 2015, Johnson still offered one of the classiest gestures seen in the Octagon, placing the belt around Cormier’s waist. He’s no doubt lying in wait to one day wear the belt he put on the current champion. What a fight this would be to headline the card. Woodley is on top of the world after dethroning Robbie Lawler to become the new UFC Welterweight champion at UFC 201, so he'll be raring to go at it again following a virtual walk in the park against 'Ruthless' in July. Diaz is back and ready to fight again from his 18-month NSAC suspension dating back to his showdown with Anderson Silva in January 2015. The 33-year-old Brazilian Jiu Jitsu specialist still has two fights remaining on his UFC contract following the Silva fight, and a Welterweight battle with 'The Chosen One' could well be the first step on the road to redemption for Diaz. The new 170 lbs kingpin has cooled off talk about the inevitable title fight against Steven Thompson, and instead publicly pleaded for a payday that will cement his legacy and elevate his standing in the fight game. Namely, Georges St-Pierre and Nick Diaz. 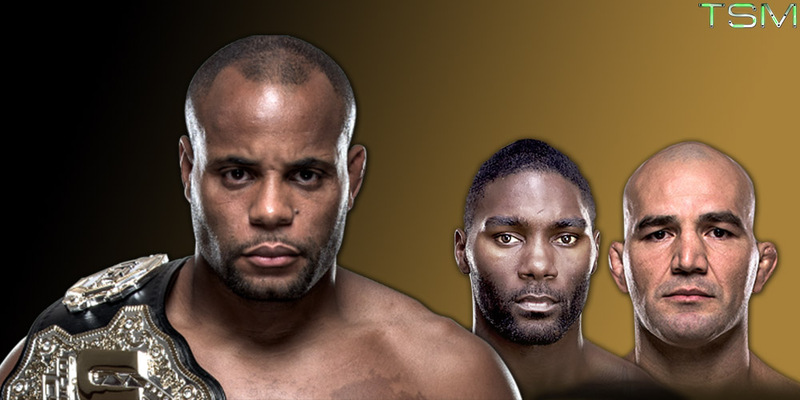 Woodley tweeted to express his displeasure at the talk of a meeting with Thompson so soon after winning the strap. 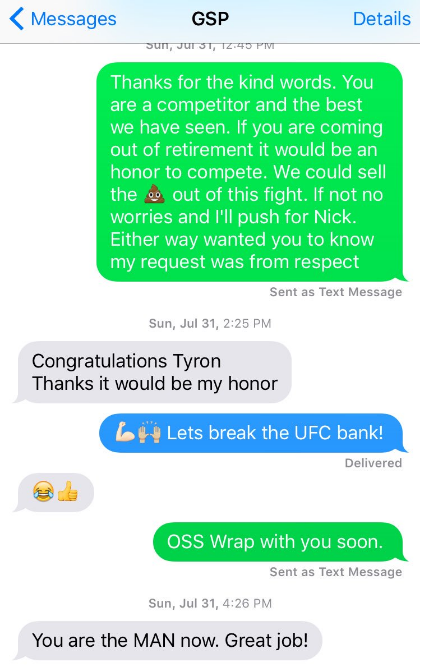 Following on from this, Woodley went on to post a screenshot of a text message conversation with GSP himself, and the evidence speaks for itself. The former champion seems invested in the idea of a comeback to the UFC and what adds further fuel to these rumours is the fact that St-Pierre was included in a pool of fighters available for USADA testing - indicating his intentions to return to the octagon. If Woodley manages to land either of these veteran fighters, he is sure to attract a huge following from casual fans and with that comes a healthy wad of cash. If the fighters want it, the fight should happen. The slight caveat for GSP or Diaz is that the bout will not be for the Welterweight Championship, President Dana White has announced Steven Thompson is definitely the next man in line to challenge for the crown.